Well this was just plain easy. And tasty. And Whole 30 approved. Yes please. I like recipes these days that are simple… they involve minimal ingredients and you just kind of throw it all together. You don’t have to perfectly measure everything out, you just season to taste most of the time. Jacob and I have continued to eat as many meals as possible that are Whole 30, but trust me, we have been perfect by no means haha! 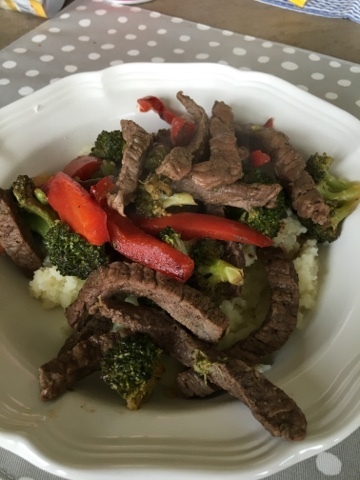 Food boredom is probably one of the main reasons we have drifted from a whole 30 diet, because we are getting tired of the same recipes over and over, so I have been looking for some new ones and compiled this one after reading through a few different stir fry recipes. Add the fresh broccoli florets, strips of red bell pepper, diced carrots and peas and heat for a few minutes. Add sea salt, pepper, ginger and cinnamon – I also added some coconut aminos at this point. Continue to heat and stir, I covered mine for a few minutes too to help the broccoli steam. Run you frozen cauliflower through a food processor, blender or I’ve found that my Ninja Chopper works the best for dicing up the cauliflower into small grains. In a separate pan, heat Olive oil and then add the grained cauliflower. Top the cauliflower rice with the beef mixture once the meat is cooked through and the veggies are done. Enjoy! I had some fresh strawberries for dessert too, yum!